Every broadcast journalist dreams of making it onto network television; no broadcast journalist dreams of making it onto network television with a pig superimposed on her face. But that's exactly what happened to me on "Jimmy Kimmel Live" Tuesday night. My station, ABC 7 in Sarasota, and I received Kimmel's Excellence in Reporting award, which, of course, is awarded to not-so-excellent journalism. 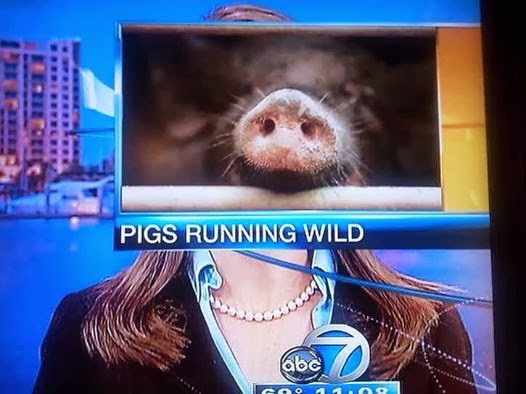 On our 11 p.m. newscast Monday, an over-the-shoulder graphic of a pig's face with the words "PIGS RUNNING WILD" mistakenly ended up right on top of my face while I was anchoring. I held back laughter as I read the rest of the story. Our crew was disheartened by the blooper, but one of our co-workers Facebook messaged us a screen grab photo and we got a pretty good laugh out of it. My director remarked he was glad it was sent in a private message instead of posted publicly for people to laugh at my/our expense. That was going to be the end of it. Until...just as I was about to leave the station and go home for the night, I said to my director, "You know what, I think I'm going to post it on Facebook. I think we could use a laugh; people will probably get a kick out of it." He chuckled and said to feel free to tag him in the post. So I did; I also tweeted it...and the likes and comments started to pour in. Again, I thought that was going to be the end of it, until... our digital managing editor posted the video clip on YouTube. Then that started getting shared all over Facebook. And once again, I thought that was going to be the end of the prolific pig post, until...our engineer came running out into the newsroom after the 11 p.m. newscast on Tuesday night saying, "You're about to be on Kimmel!" It was definitely not my network news reporting debut, but it was something! It was fun and a reminder about the power of social media. I've long been a Jimmy Kimmel fan, so hearing him say my name on his show was probably coolest thing about the whole experience. Check out my cameo here.